And lo, I beheld as KFC opened the sixth seal, and there came a rider called Zinger Double Down King, and coronary artery disease followed with him. Much has been made of KFC's Double Down sandwich, about how it's basically the sandwich Caligula would eat, about you can feel the years burning away from your lifespan as you eat one. 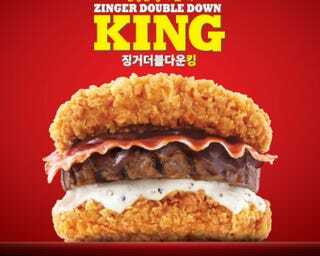 KFC Korea has, however, apparently decided to double down on the double down* by releasing the monstrosity you see before you, which, like apparently all KFC foods in Asia, has to have "zinger" appended to the name for reasons that are absolutely beyond me. I'm skeptical that anything good could come of the double down anyway considering how horrible the initial experience was. It was something you felt more than tasted — I'm not one to ever feel guilty about my food choices, but something in the double down made me feel legitimately horrible as I was eating it. It was unusually dry when I had it, too, but that was probably more of a specific issue than one that applied to all forms of the sandwich. What wasn't specific was the fact that it's a workout to actually chew through that much meat. At the end of a double down experience, your jaw will ache horribly. I fail to see how adding more meat rectifies that problem. Pro-tip: if I am telling you your sandwich has too much meat, your sandwich really, really has too much meat. * I am well aware this is in no way the correct usage of the phrase "double down"; it was too good to pass up.